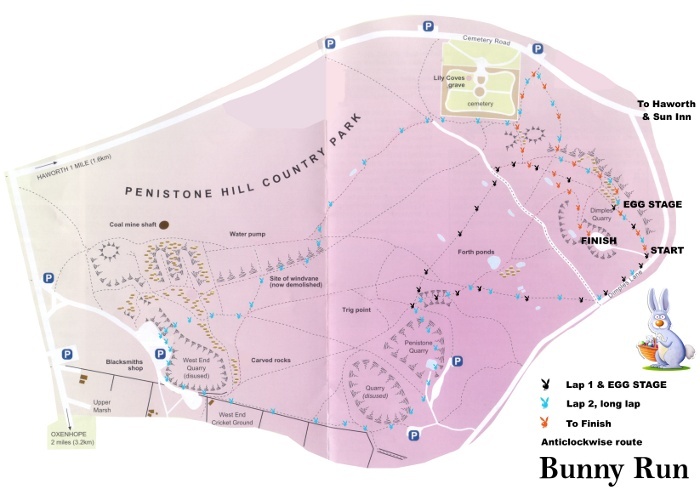 The 2011 Bunny Relays brought 77 teams onto Penistone Hill for this annual race of mayhem, with red white and blue numbers to celebrate the Royal Wedding. And it was a recordtastic event with no fewer than 5 team records being set on the night. The 'Lancashire Lads' comprising Tim Ellis, Shaun Godsman and Alex Whittem took top spot, hareing round in a time of 28:50 (with only 5 seconds difference between the three legs). Second place went to the first mixed team; 'Yorkshire Mixture' led by Jo Buckley and followed by Lee Athersmith and Ben Mounsey. First under BU16 team of Max Wharton, Bradley Traviss and William Smith finished third in a record time of 29:54. First Female team was 'Flashy, Dashy an Splat', which included Kath Farquhar, Katie Walshaw and Katie Walshaw (who enjoyed it so much that she hopped around again). Their time of 34:00 set the ladies record. Finally the fancy dress and FU14 prize went to 'Pesky Kids'; Lucy Byram, Erika Byram and Olivia Sykes who set a record of 36:51. Hopefully everyone had a great time, so until next time.."That's all folks!" This Bunny certainly sizzled with glorious warm sunny weather, 288 runners and Bunny Run legend Ian Holmes even at 45 years of age showed everybody a clean pair of heels. With perfect pace judgment he caught Egg Stage winner Tom Adams on the final climb and powered away to win in 15.04. 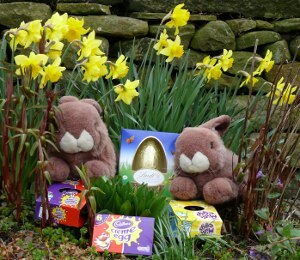 Ian's reign started in 1994 and over the years he has now amassed 30 Bunny wins, and a heck of a lot of chocolate! Katie Walshaw sizzled again winning her 6th Bunny and another Egg Stage win in a super fast 4-01, just 2 seconds outside Scary's record. England junior international Beckie Taylor finished 2nd while English FU14 champion Elizabeth Greenwood finished 3rd. The only record of the night considering the perfect conditions was by James Hall in the U16 category who took 23 seconds off William Smith's time finishing 8th overall. 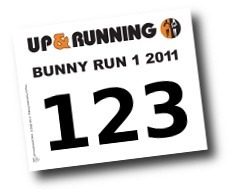 Bunny mayhem next week is the Relay, teams of 3 round the long lap only, see you there, start time 7.30pm. What a start to married life, 'Bunnymooner' Tom Adams only four days previous married his sweetheart Joanne in bonny Scotland, and here proceeded to run away from the 286 Bunny Runners to eggsterminate the Egg Stage time bringing it down to 3.17. Besides the best efforts of Wardle Skyline winner Tim Ellis, 28 times Bunny winner Ian Holmes and Adam Osborne, Tom couldn't be thwarted as he romped to victory � remember Tom is the series winner from last year! 26 year old Katie Walshaw was unnerved by the attentions of Shaftsbury & Barnet new Bunny Girl Phillippa Aulcett and new FV35 record holder Jo Buckley, but she needn't have worried, her form of late is scintillating as she recorded a very fast 17.30 only 10 seconds outside Scary Mary's record � remember Katie is the series winner from last year! Both Tom and Katie are immortalised on the overall Bunny Beer label for next weeks installment of Bunny Mayhem, remember 7-30pm start!! The start of the series saw 284 athletes young and old trying their best to stay on their feet as a fierce wind forced them every way except forward, so given these conditions the times achieved are worth at least 2 minutes on a normal windless Tuesday evening. New Bunny Boy Ben Mounsey took the Egg Stage prizes, and with a little more knowledge of the course now, will be a big contender next week. 21 year old England international Tom Addison played it cool, knowing the lactic acid you can build up by going too fast too soon is fatal and used this knowledge to pace it perfectly and win in 15-53 from fellow international Adam Osborne, with another new Bunny runner Tim Ellis third. Series winner last year Katie Walshaw continued her dominance of the Bunnies winning the Egg Stage and the race outright for the fourth time, and finally getting her name on the cuddly bunny perpetual trophy, which is only given out at Bunny One. See you all next week for more Bunny Mayhem, remember 7-15pm start!! All from Dimples Lane Quarry (Do not park in the quarry itself as you'll be in the way!). Registration at the Old Sun Hotel, Haworth, W. Yorks (GR 026372), 5 mins. from start. Individual Bunny Runs: CS. 3m/300'. �2 on night only. Teams free. PM. Over 12. Records: 14.41 J. Thomas 2009; f. 17.20 M. Wilkinson 2007; "Egg Stage" 3.17 T. Adams 2011; f. 3.59 M. Wilkinson 2007. Cadbury's Creme Egg for all entries. All prizes Easter eggs. All 3 races to count for overall awards. Winter has been and gone, dark nights are a thing of the past and Spring has Sprung, which all means one thing.....yes, it's Bunny time. They're eggciting, they're bunnylicious, they're cracking and only 3 miles long with a reward for everyone of a Cadbury's Creme Egg! The Bunny Runs & series hop to it from Tuesday 5th April, with a chocolate prize list even a chocoholic would have problems coping with! For the true Hares or those who dare amongst you, remember the 'Egg Stage', a fast and furious dash round the small loop will bring extra chocolate for the first man and lady past the hopping bunny sign. Then of course for those of you who want to have more fun, if that's possible, there always is the chance to win prizes in the fancy dress competition incorporated in the race. All runners can also take part in the guess the winners time competition � guess what the prize is? AN EASTER EGG! See the clipboard at registration to enter. The Bunnies are renowned for post race fun � free soup and roll in the Old Sun Hotel (revamped and now with the cheapest beer in Haworth) race video of that night's event on the big screen, stacks and stacks of Easter Eggs in an extensive prize list, watch in awe as the first man, lady and vet stagger under the sheer weight of goodies, then the finale the famous chocolate throw out! Here at the prize giving all runners are entered into a free prize draw with a choice of a large Easter Egg, a commemorative Prince William of Wales & Catherine Middleton tin of biscuits and 3 more lucky Bunny Bob Tailers are destined to feed their hunger craving, because the new managers Robert AKA 'Tubsey' and his wife Sarah have donated 3 baskets of delicious chips.